West Ham United and Manchester United get the Premier League up and running this weekend with a matchup at the London Stadium on Saturday afternoon. 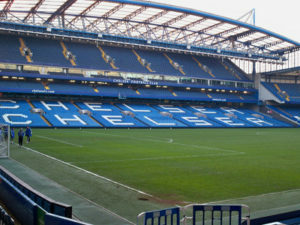 Later in the day, Chelsea welcome Liverpool to Stamford Bridge for the standout fixture of the weekend. In the EFL Championship, league leaders Leeds United make the trip to Hillsborough to play Sheffield Wednesday in a mouth-watering Yorkshire derby on Friday night. Meanwhile, Bristol City and Aston Villa lock horns at Ashton Gate. Liverpool are the early pace setters in the Premier League, winning six out of six so far to be the only team left with a 100% record. Manchester City and Chelsea are hot on their heels, with both picking up 16 points from a possible 18. Chelsea and Liverpool clash in a mouth-watering encounter at the Bridge, while Man City host Brighton & Hove Albion at the Etihad Stadium on Saturday. Meanwhile, Cardiff City and Burnley meet in the Welsh capital on Sunday afternoon in a crucial game at the bottom. The Premier League weekend kicks off at the London Stadium where Manuel Pellegrini’s West Ham play Jose Mourinho’s Manchester United. Having dropped two points at home to Wolverhampton Wanderers in their last outing, will the Red Devils return to winning ways on Saturday afternoon? Pellegrini’s Hammers have yet to win at home this season, drawing one and losing two. However, after beginning their campaign with four successive league defeats, the Irons have picked up four points from their last two, beating Everton and drawing with Chelsea. Man United, meanwhile, have taken 10 points from their opening six Premier League matches. West Ham will be buoyed by their last couple of results, but we can see the Red Devils returning to Manchester with all three points on Saturday. The away victory is available at odds of 4/5 with BetVictor. Maurizio Sarri’s Chelsea and Jurgen Klopp’s Liverpool do battle in a heavyweight showdown at Stamford Bridge in Saturday’s late kick off in the Premier League. The Reds, who sit pretty at the top, are favourites to leave London with another win. However, the Blues will not want to be beaten on their own patch. Liverpool have made a terrific start to their season, winning all of their league games as well as beating Paris Saint-Germain in their opening UEFA Champions League match. Chelsea had won five Premier League matches on the spin before being held to a frustrating draw by West Ham at the London Stadium last weekend. This will no doubt be a fascinating and thrilling affair at the Bridge, with both teams looking for the win. However, we can see the pair cancelling each other out in London. BetVictor are offering 7/2 for the draw and both teams to score. Cardiff and Burnley go head-to-head in South Wales on Sunday in an important fixture at the wrong end of the table. The Bluebirds, who have not won a Premier League game since April 2014, head into this one at the Cardiff City Stadium as the slight favourites with the bookies. Cardiff have suffered a difficult start to life back in the top flight, drawing two and losing four of their opening six games. Burnley had lost four league matches in a row before smashing Bournemouth 4-0 at Turf Moor last weekend to lift themselves off the bottom. Both Cardiff and Burnley will be desperate for all three points in this one, but we fancy this to end in a narrow home win in the Welsh capital. Back the hosts to prevail 1-0 at 6/1 with Betfred. The final Premier League fixture of the round takes place at the Vitality Stadium on Monday night as Eddie Howe’s Bournemouth entertain Roy Hodgson’s Crystal Palace. After a humiliating defeat at Turf Moor last time out, can the Cherries get back to winning ways on Monday? Bournemouth have made a strong start to their season, winning three of their opening six league fixtures. As for the Eagles, they have accumulated seven points so far, with four of those coming in their last two games. Palace got the better of Huddersfield Town in their previous away match in the league. Howe will want a response from his players after their poor showing at Burnley, and we can see his side returning to winning ways on Monday. The Bournemouth win is available at 6/5 with bet365. Despite falling to a shock 2-1 home reverse to Birmingham City last weekend, Marcelo Bielsa’s Leeds remain top of the Championship table on 18 points. Middlesbrough are only behind on goal difference, while West Bromwich Albion are a point adrift of both. Ipswich Town, who sit second from bottom, are the only team in the Championship yet to pick up a win. Will that change when the Tractor Boys travel to Birmingham on Saturday? On Friday night in the Championship, Leeds make the trip to Hillsborough to face Sheff Wednesday in what promises to be a memorable Yorkshire derby. With the Owls and Whites both in good form, which way will this derby match go on Friday night? Jos Luhukay’s Wednesday took just one point from their opening three Championship games, but their results have improved drastically in recent weeks. The Sheffield club go into this one having won four of their last six league games. Leeds, meanwhile, were unbeaten in eight Championship matches (five wins, three draws) before losing at home to Birmingham last weekend. Bielsa has made a real impact at Elland Road since joining in the summer. Leeds have looked the best team in the second tier so far, and they should take all three points at Hillsborough on Friday. Take a punt on United to win and both teams to score (7/2 at Betfair). Bristol City host Aston Villa at Ashton Gate in the Championship on Friday. Both teams could do with a positive result after suffering poor results in their last outings. City, who have lost their last two, are the slight favourites. Bristol City were on a four game winning streak before coming up short at West Brom. The Robins were then beaten 1-0 by Wigan at the DW Stadium last Friday. As for Villa, they have made a shaky start to their season, winning three, drawing four and losing two thus far. The pressure is starting to mount on Steve Bruce, with his side winning just one of their last seven in the Championship. However, we’re backing Aston Villa to secure a priceless win at Ashton Gate on Friday. You can get the 2-1 away win at 9/1 with Ladbrokes. Paul Warne’s Rotherham United welcome Gary Rowett and Stoke City to the New York Stadium for a Championship matchup on Saturday night. Both clubs have taken nine points from their opening nine league contests. Rotherham have sealed 1-0 home wins against Ipswich, Millwall and Derby County so far, but the Millers have already been beaten six times. Stoke have found life back in the Championship tough going up to now, winning just twice to sit 18th in the table. Stoke no doubt have the better players, and Rowett will be demanding a strong performance from his players in South Yorkshire. The Potters to be winning at half time and full time is priced at 5/2 (BetVictor).